Notice how elegant they are and how graceful the design of this window is. Let us focus on some details. 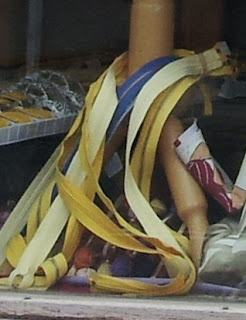 At the bottom of the blue dress, you see a collection of belts, in Swedish colors (blue and yellow), of course. This is surely the perfect place to display belts. Look at the white dress next to the mannequin. Pretty, isn't it? In fact, there is a mask attached to it. Let me explain its use. Swedish women of any age, from 10 to 90, will wear this dress easily. Non-Swedish women may have a problem with it. They may think that it's old-fashioned. (Clearly, they are not that advanced, yet.) This is why the mask is provided. 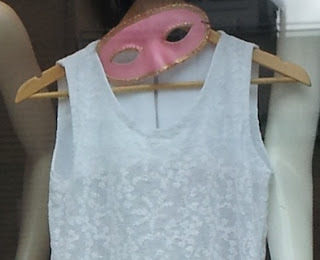 It is given for free and it can be used by non-Swedish women who wear this dress; they can cover their face. Last but not least, look at the faded picture of Marilyn Monroe. An excellent addition to the artistic window design. Yves Saint Laurent had never visited Sweden. This is why his designs remained so primitive. dcvq. Simple theme. Theme images by subjug. Powered by Blogger.